This was sweet, smooth and full of fall like spices. It poured a nice orange with a small but decent head. It was not exactly light bodied but it wasn’t full either. It’s a bit nutty and sweet with a nice bitter balance. A decent Oktober but not in the upper crust by any means. In celebration of hop picking season Sam Adams has released the Hallertau Imperial Pilsner in limited release. The beer pushes the boundaries of flavor, according to Sam Adams, with 12 pounds of hops per barrel of Bavarian Noble Hallertau Mittelfrueh Hops. “Samuel Adams Hallertau Imperial Pilsner is brewed for the hungry-for-hops beer lover and the entire community of great beer connoisseurs who are always on the hunt for a brew that unabashedly pushes the boundaries of flavor,” said Jim Koch, founder and brewer of Samuel Adams(R) beers. “Each fall, I travel to Bavaria and personally hand select the highest quality Noble hops used in the Hallertau Imperial Pilsner to ensure every bottle is bursting with the distinct bitter taste and floral aromas typical of Noble hops from this region, and necessary to support the bold, extreme flavor found in this beer,” Koch added. Just as different grape varieties lend distinct characteristics to wine, hop varietals offer their own distinguishing flavor and aroma character to beer. While average beers use an ounce and a half of hops per barrel and a big, full-flavored beer like Samuel Adams Boston Lager uses a full pound, Samuel Adams Hallertau Imperial Pilsner — one of the “hoppiest” beers available — is brewed with approximately 12 pounds per barrel of Hallertau Mittelfrueh hops. These prized hops are only grown in the Bavarian region in Germany, considered one of the best hop-growing regions in the world. 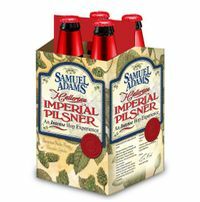 Samuel Adams Hallertau Imperial Pilsner will be available in 4-packs of 12 oz. bottles at select specialty beer retailers beginning late September 2008, for a suggested retail price of $9.99. Tough day for big brewery works all around. The Pittsburgh Tribune-Review, is reporting that City Brewing Co. plans to lay off some workers at the former Rolling Rock brewery in Latrobe later this year. The LaCrosse, Wis. company says the layoffs will occur so it can attract more business and upgrade the brewery’s equipment. The brewery employs about 100 people. City Brewing bought the Latrobe facility after Belgian brewing giant InBev SA sold the Rolling Rock brands to Anheuser-Busch. Anheuser-Busch stopped making Rolling Rock in Latrobe in July 2006 when it moved production of the beer to Newark, N.J.
City Brewing has been making Samuel Adams beer at the Latrobe brewery for about 14 months under a contract with Boston Beer Co. But Boston Beer has since bought a brewery in Lehigh County where it can also make Sam Adams. The companies owned by privately held Metromedia Restaurant Group of Plano, Texas, filed for bankruptcy protection on Tuesday in the Eastern District of Texas, less than two months after Metromedia said it was not preparing to do so. It wasn’t clear whether franchisee-owned restaurants would be closing as well. While I could say something snippy here I’m guessing Bennigan’s brought plenty of Sam Adams and Guinness and other mid-level craft beers to some far flung areas. Maybe it opened a few people up to craft beer. We all have to start somewhere. I personally have never eaten at one.